I mentioned that I would post part 2 of Augmented Reality, but I didn't get around to it. Reason #1: 3 miles on the treadmill at an incline of 11! Not bad! Reason #3: Met with my fabulous (sniff-sniff, drop a tear or several) former grade level for lunch. Love that group! 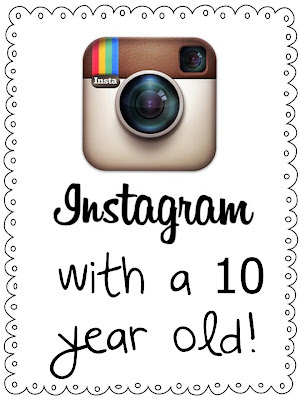 Reason #5: "Mom, I want to start an Instagram account." The inner struggle in me starts...the educator vs. the mom! Mother: Do you understand the responsibility that comes with this account? Daughter: All my friends have an account. Mother: If all your friends jumped off a bridge would you do that too? Ok, I didn't say that! Mother: I understand, but with this, comes a great deal of responsibility. Mother: Ok, but we are going to talk "house rules" of Instagram! Your profile picture is not to be an actual picture of yourself. You must have the account locked down! (Helped her do this.) You must accept requests from followers and you MUST know who they are through a text or phone call! NO random requests! Mother: (Deep breath...we've had this talk before!) There are REALLY bad people out there called pedophiles (Yes, I threw that word out there!). They do VERY bad things to kids. They act like they are your friend. If someone asks for your address, phone number, school name or anything personal, you will say, "I'm sorry that is personal information! If you know me, you will already know that information!" You must accept your mother as a follower! Mother: Have you heard of a digital footprint? Mother: No matter what you post, picture or words, it is forever out in the world even if you delete it. Mother: Remember, when the counselor did a lesson about saying things that sometimes we regret? She used the toothpaste as an example for words we say. Once you say it (post words/pictures) no matter how hard you try, the toothpaste won't go back in the tube? Same with the Internet...once out there...forever out there! It's called your digital footprint. From that point on, we went to work on her account. 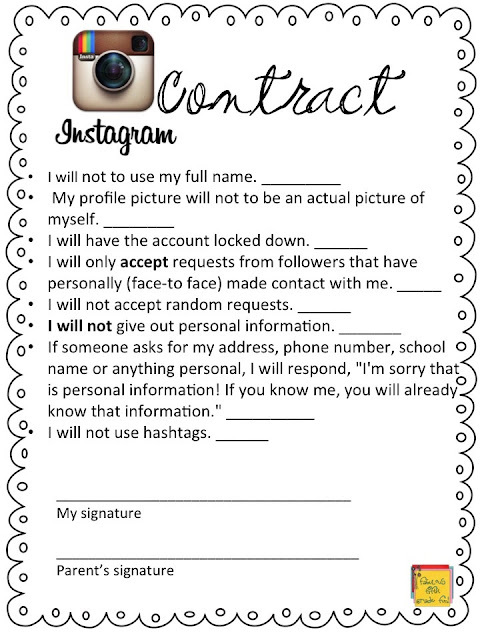 When my daughter wakes up in the morning she is going to sign this contract. The lines out to the side are for her initials. I'm going to insert the fact that there is no mention of talking/posting negatively about others on this contract. You have to understand, this contract is made for my daughter, who happens to still love American Girl dolls, puppies and rainbows. She cries when there is conflict among her friends and tries to be the peace keeper. She will not use the word hate and gets upset when people use the "c" word...crap. Sheltered? Maybe...and I'm ok with that! You are more than welcome to a copy of the contract. Click on the contract for a copy. Further discovery...Instagram states that it is not for children 13 and under. At no time, did it ask her age! Did I miss something? All of this leads me to...Digital Citizenship! What does your school do for digital citizenship? Do you have a curriculum that you follow? Common Sense and just found Socially Active for info on Instagram. 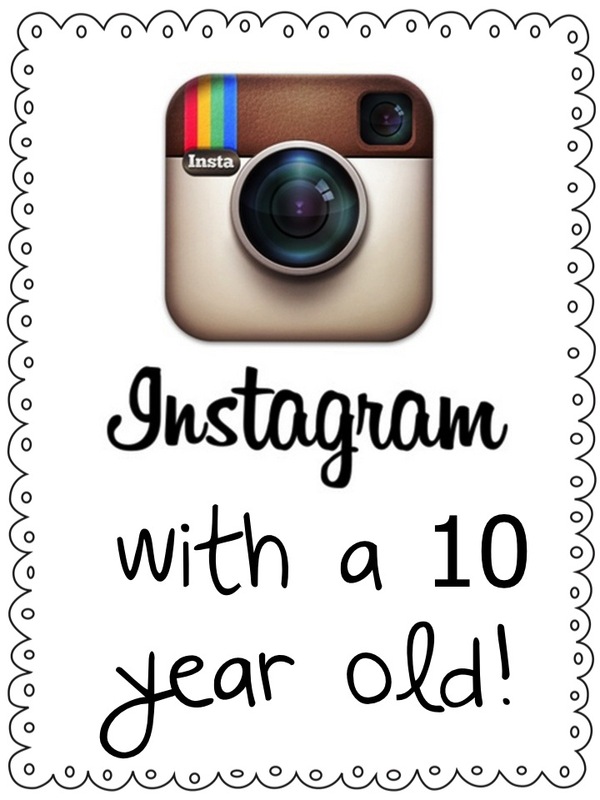 Did I help my daughter add some really fun apps that I use for Instagram? Yep! In about 10 minutes did she become more creative than her mother with photos? Yep! What tonight really was about was having an open discussion with my child. The fact that she came to me first before creating her own account. It was about open dialogue between the 2 of us. Will I follow up in the morning? Yep. Will I monitor her account? Yep. Not because I don't trust her, but because she is 10. Way to go MOM! :) Good Job. I LOVE the contract idea! I have a 22, 16, 15, 13 and 6 year old and do I read their facebook messages, and check their instagrams and read all their texts? You bet I do! It's a different world today than when we were kids and it's our job to guide and protect them as much as possible. My kids know that I will read what they write and post. We talk about what is appropriate to post and about pictures. I wish every parent would talk to their kids about the dangers. Some of my kids friends worry me about what they post. I think your daughter is gonna have a blast with instagram. Hard letting our "babies" grow up isn't it? I am loving the contract. I use Common Sense media now after doing a BYOD course. Good stuff!